As was the case with many Canadians, last Wednesday I couldn’t get any work done. 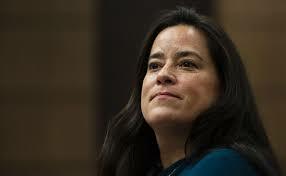 I sat glued to my 70 inch television watching the riveting testimony of former Minister of Justice and Attorney General Jody Wilson-Raybould as she testified before the House of Commons Justice Committee. I was so convinced that her testimony would be ground breaking that I set my PVR to record both the testimony and the following commentary by pundits on both channels that were broadcasting the historic event. And the former Attorney General did not disappoint. Many had speculated that in her testimony Wilson-Raybould would ‘nibble around the edges’ and perhaps create a weak ‘he said-she said’ scenario. Wrong, there was no nibbling around the edges. Wilson-Raybould got right to the heart of the matter. Of note is that she did not say in her role as Minister of Justice and Attorney General, rather, just in her role as the Attorney General. This made it very clear that she had a firm grasp of her postion and the difference between her dual roles. On one hand she was the Minister of Justice, a member of the cabinet; on the other, she was the Attorney General, two very separate and distinct roles. Two very distinct roles that dictated two very different types of communication and interaction that cabinet colleagues, the Privy Council office, the PMO and the Prime Minister himself could have with her. As the minister of Justice they could communicate with her politically, however in her role as the Attorney General the communication needed to be on a legal basis as outlined by law and convention. It would appear that this distinction was lost on the Prime Minister, the Clerk of the Privy Council and political staffers in the PMO. Not only did they blur the lines, they obliterated them. There is one point that I’ve thought a lot about since I watched Ms Wilson-Raybould’s testimony and listened to endless commentary and the opinions expressed in the subsequent media coverage. 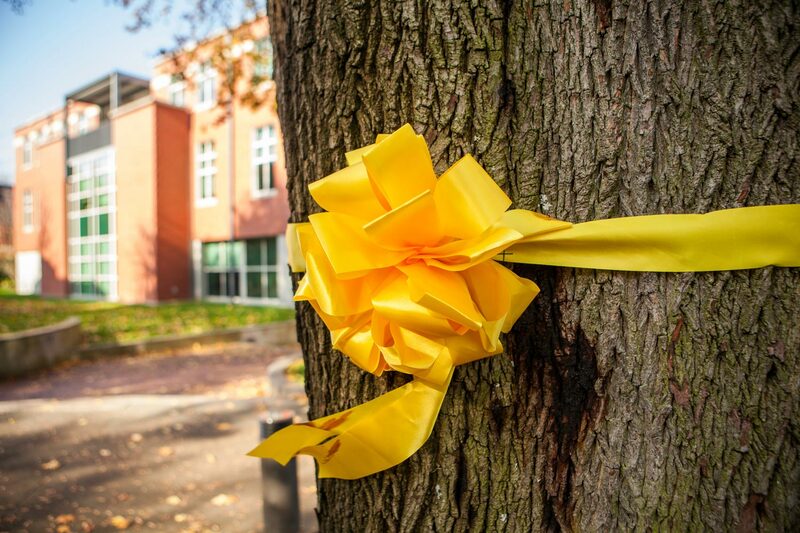 Much has been made of the fact that the former attorney general would not take into consideration the so called ‘additional information’ being pushed forward by SNC-Lavalin through the Prime Minister and other political entities. The fact is, Ms Wilson-Raybould did provide the opportunity for SNC-Lavalin to advance their legal argument in an appropriate manner. I offered that if SNC were to send — I offered to the clerk, if SNC were to send me a letter expressing their concerns, their public interest arguments, it would be permissible, and I would appropriately forward it directly to the director of public prosecutions. This offer was never followed up on by SNC-Lavalin. The question is, why not? The answer is: the former attorney general made an offer to SNC-Lavalin to mount a legal argument. The reason SNC-Lavalin did not respond is that in all likelihood they understood that they did not have a strong legal argument to make, in favour of a deferred prosecution agreement. SNC-Lavalin through their pressure on government wanted the government to arrange a political solution to a legal problem. The Prime Minister, the PMO and the Clerk of the Privy Council through their “sustained effort” to “politically interfere in the exercise of prosecutorial discretion” attempted to deliver exactly what SNC-Lavalin wanted: a political solution for a legal problem. But for the resolve, courage and integrity displayed by Jody Wilson-Raybould, they might have succeeded. 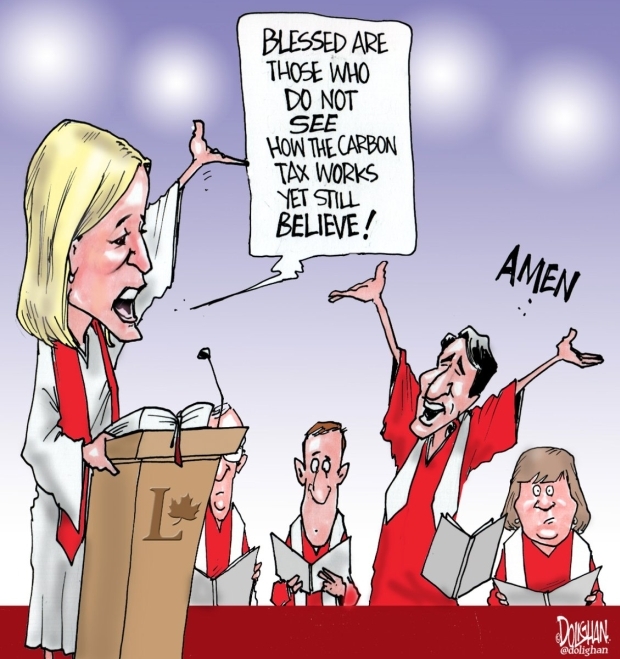 Is it a carbon tax or perhaps the Great Canadian Carbon Scam? Governments of all stripes have repeatedly demonstrated throughout history that they are not stellar stewards of our money. Every dollar that flows to government in the form of taxation (any form of taxation) is potentially a dollar wasted. Every dollar we keep out of the hands of government is potentially a dollar saved. Enter the Trudeau Liberal carbon tax. The Trudeau Liberals started out touting the carbon tax as being revenue neutral. The carbon tax would be flowing back to the people who paid it. The current iteration of the plan calls for 90% of the tax going back to the people who paid it. And of that 90% only 70 % of taxpayers will get back at least what the tax cost them, which means the other 30 % will in fact be ‘taxed” by this so-called revenue neutral taxing scheme. The question that arises is, apart from the inequity of the carbon tax how is taxing Peter and then paying Paul (who is actually Peter) 90% of what you took from him going to contribute to a reduction of emissions? That is a question that has not been adequately answered. The second question is who gets the remaining 10% and how ill that contribute to cutting emissions? At present it is designated to go the schools and hospital and other such entities that are not able to pass the tax on to consumers. Lastly there is another question that has not even been asked. What will be the cost of creating the and running the bureaucracy that will administer this new tax? Will there be a tax or surcharge to pay for the cost of collecting and redistributing the tax back to some but not all Canadian? Or is that what the money that the 30% who will not be getting back what the tax cost them will be used for. Lastly, is this perhaps just another pre-election bauble or ‘shiny thing’ the Liberals are throwing out there to distract voters from the other issues facing this country in the hope that the electorate is gullible enough to fall for it? 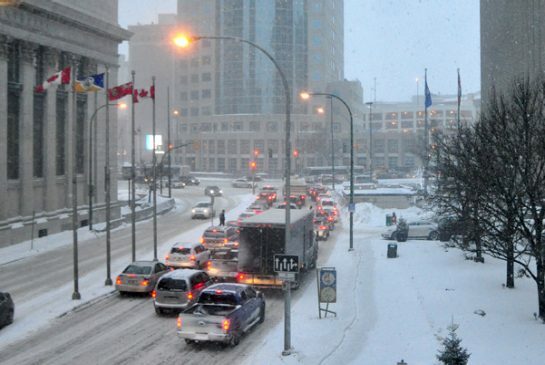 Portage and main in the winter time is a cold, windy not to mention slippery place to try and walk. Songs have been written about it. It has been the venue for public rallies. 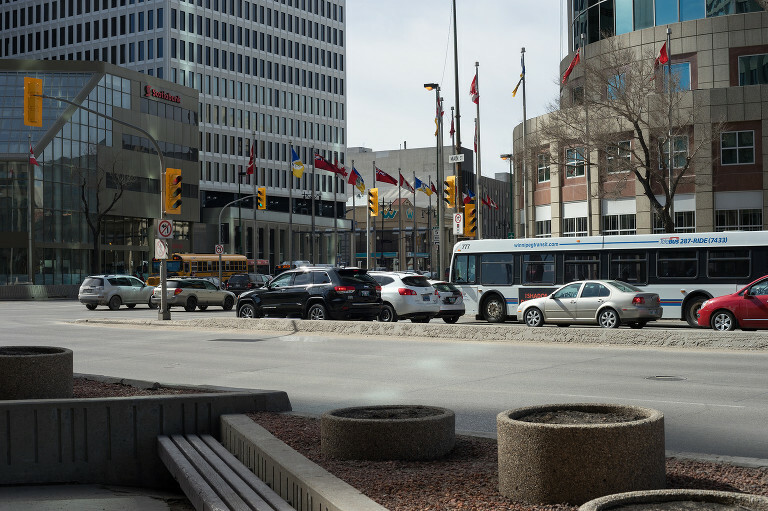 Originally an ox cart crossing in the late 1800’s Portage and Main has evolved into Winnipeg’s most iconic intersection. My first memories of Portage and Main date back to the early 1970’s when I was a new recruit with the Winnipeg Police Force (as it was then called) . Police recruits attended classes in the morning. The classroom was located on the 5th floor of the Public Safety Building. Then in the afternoon recruits were assigned to walk beats in the downtown area and of course do traffic duty. Some of the most dreaded traffic points were Portage and Donald, Mayfair and Main and of course the biggy: Portage and Main. Portage and Donald was not all that problematic except for the fact that is was the route used by the then Deputy Chief J. C. Webster to make his way home and the poor Constable doing traffic duty there needed not only to try and keep traffic flowing smoothly but also had to keep a sharp eye out for the Deputy’s car. The Deputy liked to be saluted and in that era hell had no fury like a Deputy not saluted. Then of course there was Mayfair and Main. That intersection was a two-person job. One recruit would be out in the middle of the street actually directing traffic, and the second would manually operate the traffic signal box changing the traffic control signals from green to amber to red based on traffic flow. What made this intersection dicey was that the Superintendent in charge of Training and Personnel (Charles S Tully) and the Sergeant Instructor (Thomas Arfield) both rode the bus home along Main Street and woe be to the Constables who failed to facilitate an orderly flow of traffic especially the traffic that was south bound on Main street. Then there was Portage and Main. The intersection from hell in terms of traffic and traffic duty. The constable assigned the task had to juggle three lanes of traffic approaching Main street from Portage Avenue east bound, and Main Street both north and south bound as well as a lesser flow of traffic from East Portage Avenue heading west. Controlling those wanting to turn left, right or proceed straight through was bad enough but then add pedestrians to the mix and it was a nightmare. Due to the cold conditions in the winter, pedestrians invariably kept crossing the street well after the don’t walk signal came on and because of the congestion in the area, drivers kept entering the intersection when the traffic light turned amber and well beyond. The result was gridlock and of course many close calls including the occasional accident involving cars and pedestrians. With all the honking of horns, and pedestrians shouting at drivers it was like being in New York. The closing of Portage and Main to pedestrian traffic in 1978 was a major step forward in terms of pedestrian safety and traffic flow in downtown Winnipeg. Now our Mayor who was knee high to a grasshopper when the change was made wants to stage a nostalgic ‘back to the future’ and reopen Portage and Main to pedestrians. Using the words of an actor from a movie some years back: ‘big mistake, huge’. The City has grown substantially since 1978 (by approximately 150,000) and traffic flow which was a problem then is an even greater issue now. The re-opening or Portage and Main to pedestrian traffic would be a great plan if your end objective was to bog down the center of Winnipeg into a total rush hour gridlock and at the same time endanger the lives of pedestrians. So if that is your objective, Mayor Bowman, the re-opening of Portage and Main to pedestrian traffic will be a booming success. Have at it. Oh, and by the way, how about a few hitching posts – they used to have those along Main Street as well. I’ve been writing the Policing Politics and Public Policy blog since 2009. This fall I decided to start-up a new blog that deals with a totally different subject mater, golf. I will be adding a number of posts throughout the winter that cover with a variety of golf related topics that I hope will be of interest to golfers in Winnipeg and elsewhere.